Muthurajawela is a mangrove swamp at the southern end of the Negombo lagoon. Boat safaris in the Muthurajawela wetlands are a major attraction for holiday makers in Negombo. Numerous bird species can be observed. Crocodiles occur and large water monitors are seen quite frequently. Muthurajawela is a mangrove swamp at the southern end of the Negombo lagoon. 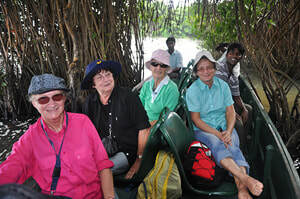 Boat safaris in the Muthurajawela wetlands are a major attraction for holiday makers in Negombo. Numerous bird species can be observed. Crocodiles occus and large water monitors are seen quite frequently. The marsh and of Muthurajawela is a sanctuary situated very close to Colombo International Airport, about 30 km north of Colombo city. 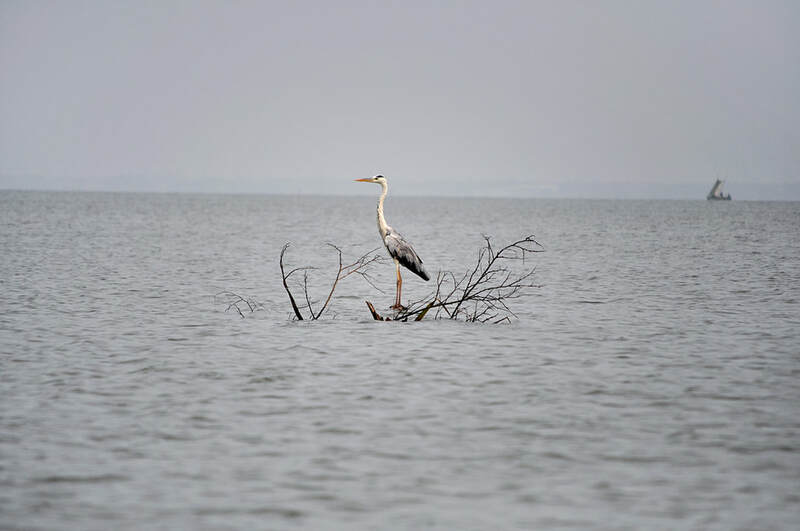 The protected area covers approximately 6,000 hectares, inclusive of the southern part of Negombo lagoon, which covers 30 square kilometers. Though not covering a very large area, the mangrove swamp of Muthurajawela is Sri Lanka’s largest saline coastal peat-bog. Amidst the otherwise densely populated west of the island, Muthurajwela is a surprisingly untouched coastal ecosystem. Many guests have difficulties to pronounce this Sinhalese name “Muthurajawela” as it seems to be endlessly long. But remembering it is simple, it consists of three words “muthu” for “pearl”, “raja” for “king” and “wela” for “land”, each of these words is stressed on the first syllable. The “ra” of “Muthurajawela” is the most-stressed syllable of the word. You will pronounce the whole name correctly even if you only stress this “ra”. The name “pearl-king-land” refers to a local legend of a perl treasure hidden here by a king. But we are not sure we will be able to show you those pearls. The amphibic landscape is an attraction in itself. It’s a transition zone between land and water and also between fresh water and open sea. The daily high tide brings in seawater from the ocean into the wetland. Continuous mixing of these two waters leaves a brackish ecosystem that is biologically diverse. 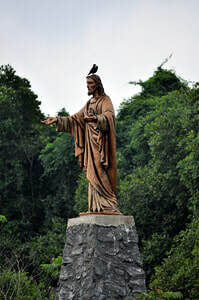 Muthurajawela is a refuge for water birds, migrant as well as breeding flocks, in this western part of Sri Lanka usually densely built over by the outskirts of Colombo. 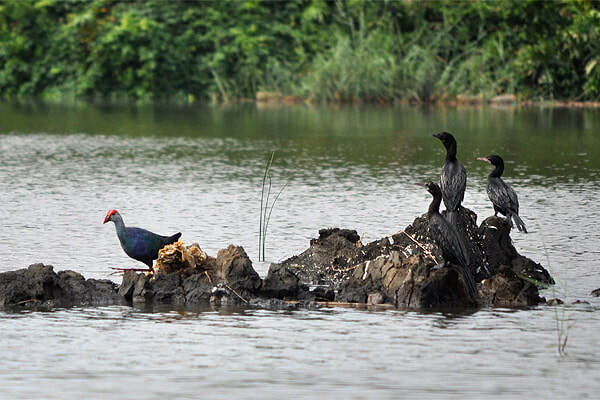 Thus, Muthurajawela wetlands are good for bird watching in particular. Bird species that can be seen here include egrets, purple herons, lesser whistling ducks, moorhens and four species of kingfishers. 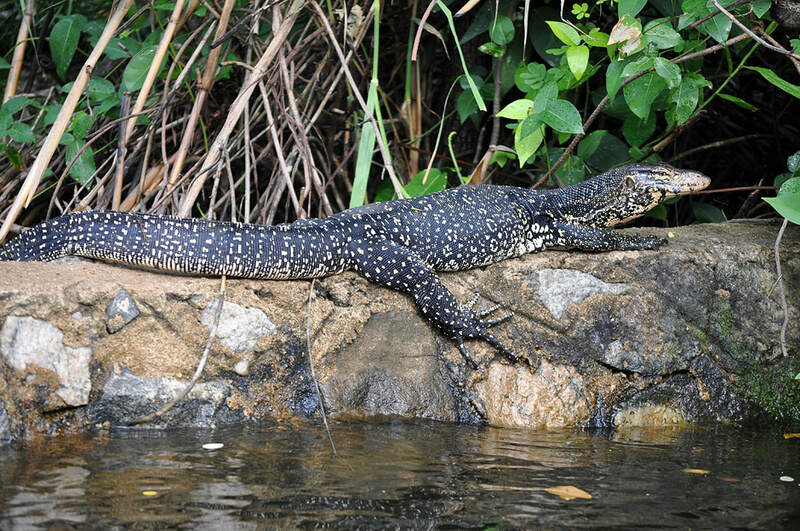 Most visitors will not spot crocodiles here, but you have best chances to observe water monitors (Varanus salvator), which are of almost the same size as crocodiles. And you will certainly not miss the toque monkeys. Muthurajawela harbours over 194 species of Flora distributed over 66 families of seven major vegetation types which includes marsh, lactic flora, shrub land, reed, swamp, grasslands, stream bank and mangrove forest. 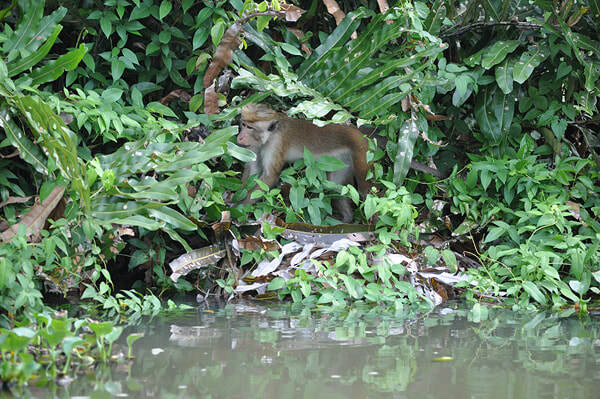 15 amphibian species, 32 reptile species and 34 mammal species occur in this sanctuary. Sri Lanka’s largest snake, the Python, is native to this wetland sanctuary. Of the many species of birds, butterflies and fish some are endemic in Sri Lanka. Average annual prepipation in this northern part of Sri Lanka’s tropical wet zone is 2000-2500mm. Muthurajawela is really worth a visit, particularly for those who spend their holidays in Negombo or have to stay a few days in the Colombo area. It is a good place to start your nature exploration in Sri Lanka after arriving at the nation’s most important airport. The Muthurajawela sanctuary can be explored by boat rides only. The boat trip starts at the visitors center slightly further south, at a side road of the coastal road B596 in Walikatiya. 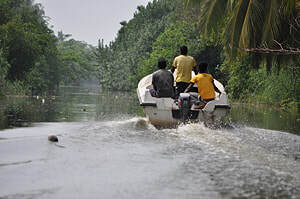 The boat safari will lead you along the the historical Dutch Canal to the Negombo Lagoon and to the bordering mangroves and cross the river delta of the Attanagalla Oya forming the main part of the Muthurajawela swamp on the way back.